Facial Rinse isn’t just seasonal – an alcohol free toner is an important step in skincare that can be used year round. It prevents breakouts, soothes the skin, improves the absorption ability of the skin and restores balance. But, the summer brings along new activity and your skin may change accordingly. When talking about toner, most people will emphasize the effect it has in keeping your face clean and glowing. It’s in the name, Facial Rinse, but your body needs love too! In the summer months, shaving generally becomes more frequent. Applying facial rinse to your legs after shaving can help prevent ingrown hairs and inflammation, and help you stay protected with the antiseptic and antibacterial properties of thyme leaf extract. Spoiler alert: You may find the man in your life sneaking it into his routine too! 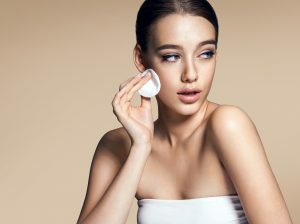 When removing makeup, it’s important to ensure that you’ve removed all of the product to allow your skin to breathe freely. After you use your cleanser you may notice that your skin still contains traces of foundation or even dirt. Adding an alcohol free toner with a natural astringent like calendula flower to your skin regimen will balance your skin and make for a deeper clean to remove any additional impurities. While you should always make sure to protect your skin before heading outside, sometimes a sunburn is inevitable. These burns can be painful, but facial rinse can reduce your healing time to get your skin feeling new again. The aloe vera extract in Facial Rinse is anti-inflammatory and provides cooling effects, while neem leaf repairs the skin. Best of all, the lavender oil is soothing and hydrating, so it won’t dry out your already sensitive skin! In the summer, days are brighter and longer – and probably busier too! It’s important to take some time to de-stress and relax. Facial Rinse’s lemon and sweet basil have aroma therapeutic properties that are calming, uplifting and useful in curbing stress and anxiety. Cleanse your skin, cleanse your soul. For those who choose alternative methods of hair removal such as waxing or laser – Facial Rinse can be used similarly. The soothing and cooling nature of comfrey and rosemary extract can reduce any redness that may arise. Similarly witch hazel closes the pores, reduces irritation and tones the skin. Getting a good workout in always feels great, but the sweat that a workout brings with it can cause trouble if it settles back into your skin. Patting your face down with Facial Rinse soaked cotton pad after a workout which contains sage leaf extract regulates excess oil that can clog pores and lead to breakouts. This is especially helpful during the summer when you are prone to sweat more, even outside of the gym! Mosquitos and bugs thrive in the summer, but that doesn’t mean you can’t. If you happen to get bit, applying facial rinse which contains turmeric root and witch hazel, to the area can serve as a natural remedy that will help stop the itching with its soothing and anti-inflammatory ingredients. Hot days can translate to pool days. In the summer, who doesn’t like to cool off by going for a swim? But, chlorine found in pool water can dry out your skin. The aloe vera in Facial Rinse counteracts these effects by stimulating cell production and rehydrating the skin. For most with psoriasis, the sunlight of the summer brings some relief. But, some aspects of summertime activity can trigger psoriasis reactions – like dry skin from chlorine filled water. Facial Rinse contains comfrey leaf extract, which is a great natural treatment for psoriasis. Using Facial Rinse to combat these effects provide some relief, while leaving you feeling better about showing more skin. Facial Rinse contains witch hazel which tightens the skin and can reduce puffiness that may be caused from lack of sleep or an especially tiring day. If your skin is looking a bit dull towards the end of the day, but you are set to enjoy evening plans, facial rinse can give you just the refresher you need. Our All Natural Facial Rinse is an all natural gentle, alcohol-free calming toner. Over 15 different botanicals work together in balance and harmony to help establish the skin’s natural balance while leaving a light emollient softening effect.